Dirty Bike Assembly Parts Cause Poor Shifting and Unnecessary Wear to Expensive Parts. Our Bicycle Clean Brush Kit Contains Everything Needed to Quickly and Easily Clean the Chain, Freewheel Cogs, Chain Rings, Crank, Tire ,Sprocket, Cassette and so on. 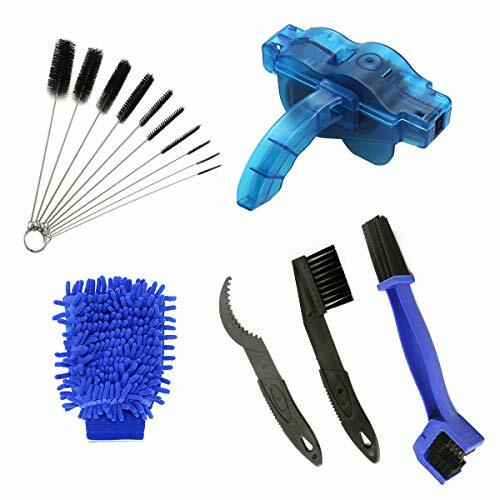 Easy to Clean, different brush cleans different parts of bike, this can efficiently and easily remove dirt from hard to reach areas or any other hygienic dead corners. Just mount the chain scrubber under the bike chain, put the detergent into the scrubber, hold the chain scrubber with left hand and turn the pedal with right hand in the counterclockwise direction for cleaning. Flywheel Gear Brush is good for cleaning chain and freewheel. Works great on brakes or other places where dirt collects.